Wales could be facing a midfield injury crisis ahead of their Six Nations Championship match with France. 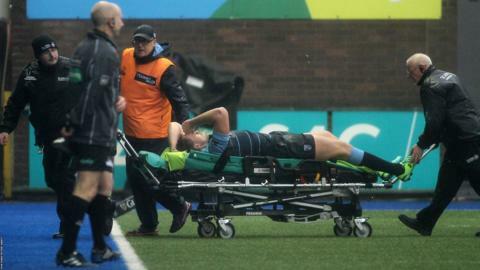 Centre Cory Allen was taken off on a stretcher during Blues' 14-13 defeat by Leinster on Saturday. "He'll be in a protective boot for the next 24 hours and he'll be assessed," said Blues coach Danny Wilson. Fellow centre Jonathan Davies missed Clermont Auvergne's 28-17 over Castres and fly-half Rhys Priestland injured a leg playing for Bath against Wasps. Davies has a groin injury and Wales coach Warren Gatland has delayed his team announcement for Friday night's game until Wednesday. Wales are already without Scarlets centre Scott Williams, who has not played since Wales' 28-25 win over England in October. Allen was one of seven Wales squad players released to the Blues by Gatland. He turned on an ankle early in the second half, and was wearing a surgical support boot after the match. Allen had already missed much of the season with a hamstring injury suffered playing for Wales against Uruguay in the World Cup, and only returned to action at the end of December. Another player carrying an injury is second row Luke Charteris, who hurt his knee in the 27-23 win over Scotland. He missed Racing 92's match with Grenoble, and - along with Davies - will be assessed by medical staff when he returns to the Wales camp. Preistland took a blow to the leg in Bath's defeat by Wasps, but the club's director of rugby Mike Ford said he does not think it is serious.